These flexible and adaptable structures are easily put to great use around the home or business in multiple ways. 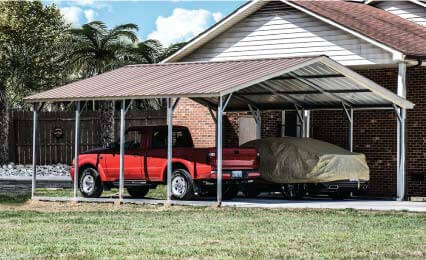 Not only will a metal carport adapt to fit your needs as they change with time, the steel construction ensures it will last longer than you expect and pay back your investment many times over. That’s why we backup our metal carports with a 20 year warranty. The regular roof style is one of the most common choices for capping off the top of steel carports, and that's no accident. The design of regular roof metal carports offers many benefits to the home or business owner looking for a quick and affordable way to cover more space. For some homeowners and business owners, only the best will do. Living in a harsh climate takes its toll on outdoor structures, but our vertical roof metal carports can handle it all. These steel structures offer the highest wind resistance and greatest snow load capacity of all carport roof styles thanks to the reinforced style of roofing. If you're not sure how vertical roof steel carports are different from the other options listed here on the website, review this page! Every product line has a mid-range option, and A-frame metal carports are a great example of this concept. This style of roofing is durable and attractive, offering more benefits than basic regular roofs at a more affordable price than top-of-the-line vertical roofing. 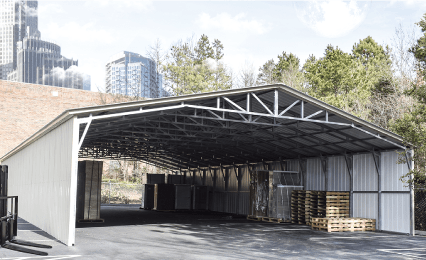 Whether it's called a carport specifically or goes by another name like a metal structure or open metal building, these easily assembled structures have many different uses. You might start out by installing a metal carport to protect a new car’s paint job – then decide to add walls and power and create a workshop after a few years pass and you sell the car. 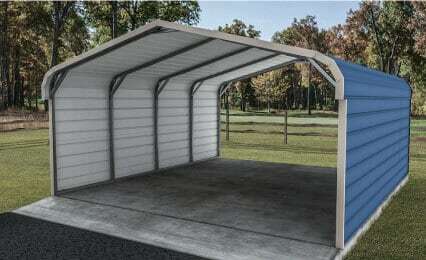 A steel carport is also easily transformed into an agricultural building with custom design work. Don’t forget about covering a walkway between two parts of your home or expanding outdoor storage space for landscaping equipment. Aluminum carports are also available, but we only offer steel carports here at MetalCarports.com. Steel is twice as strong as standard aluminum, and it also offers greater resistance to damage from weathering and corrosion with galvanized or coated. Steel also won’t turn chalky and worn looking as the years pass, which can be a problem with exposed aluminum structures.